Two photographers explore the landscape they encounter from moving vehicles in two totally different styles. 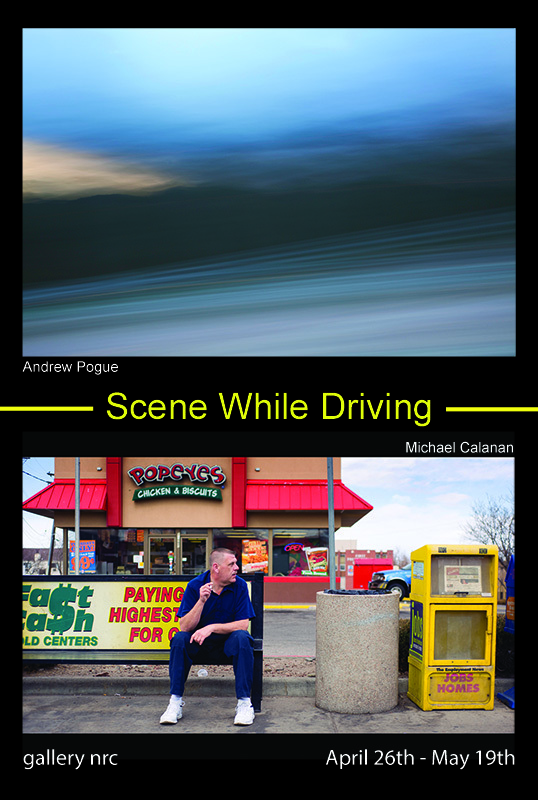 Michael Calanan captures the unique moment and the story of Denver’s neighborhoods, while Andrew Pogue shows the motion giving an abstract sense of place in his images, letting you create your own story. When traveling by car most people think about what they are passing, and these two photographers take that feeling in the familiar area of Colorado. Michael and Andrew are commercial photographers living in Denver, Colorado who found their personal work is complimentary to each other. Michael is an editorial photographer with specialties in portraiture and live music/event photography. He is also the Vice President of the Colorado Chapter of ASMP. Andrew is an architectural photographer and has recently relocated to the Denver area from Austin, Texas. His background in architecture and visual studies gives his work proclivity from an invaluable perspective. Join the photographers on Friday May 4th at gallery nrc and talk to them in more detail about their work and vision for their collection of images in Scene While Driving. The gallery will be open May 4th from 6:00 P.M. – 10:00 P.M. as part of the First Friday Art Walk on Tennyson Street. The show runs from April 26, 2012 – May 26, 2012.